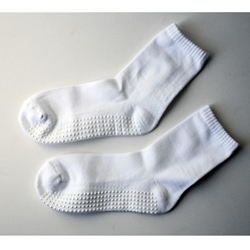 Our white calf height non slip socks will fit a 7" to 11" foot. They are made of 80% cotton, 15% spandex, and 5% elastic. Our sock features terry cloth on the inside bottom foot portion to provide extra padding. Imported. Watch this video featuring this socks below.